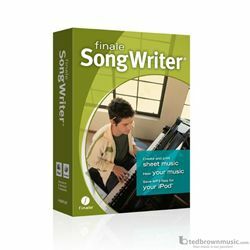 Designed especially with song writers in mind, Finale SongWriter is the fast, easy way to create and print professional-quality sheet music. Enter notes with your mouse, computer keyboard, or MIDI device - or import MIDI and/or MusicXML™ files. Create great-sounding and - looking sheet music that plays back, then share your music in more ways than ever before. Sheet music that plays back: With SongWriter music notation software, you can listen to the results before the rehearsal. When you can hear what you've written you can quickly refine your music to sound exactly the way you want. SongWriter does the heavy lifting, like managing how each staff plays back and transposes, so you don't have to. Simply select the instruments you wish to write for and get started! Don't let great ideas get away! : When inspiration strikes, you want to notate it quickly. Simply play your MIDI keyboard and music automatically appears in SongWriter. Or if you prefer, enter notes with your computer keyboard or mouse. Create music with others: Work with collaborators? SongWriter can help here too, even if your band mates use different software. SongWriter can open files made by the entire family of Finale software like Finale PrintMusic and Finale Allegro, as well as import MIDI and MusicXML files created by hundreds of other products. Breathe life into sheet music: SongWriter offers professional instrument sounds, realistic playback, and creative inspiration. Hear your notes as you enter them, then press Play to hear how they interact. This instant feedback empowers you to quickly shape the music of your imagination. But SongWriter does more than make sounds. SongWriter makes music - and even offers creative suggestions. Human Playback® and high-quality software instrument sounds: Your music deserves to be heard with all the feeling and phrasing you imagined when you wrote it. Human Playback makes this possible by playing your music with the nuance and expression of human performers. When Human Playback is combined with the high-quality software instrument sounds built into SongWriter, the results are amazing. Arrange your song with creative input: Need help harmonizing your melody? Not sure what the drummer should play? No problem. SongWriter offers composers and arrangers idea-generating tools to save time and suggest creative options. Band-in-a-Box Auto-Harmonizing can automatically turn your melody into two- or three-voice harmony. Use Drum Groove to easily add custom drum parts in a variety of styles. Mix your recording: An integrated mixer lets you further shape the sonic space where your music lives. You control reverb, panning, balance, and more. Share audio files, sheet music, electronic files – whatever works best! : The drummer only plays by ear. The horns want printed charts. The keyboardist wants electronic files she can edit. Isn't it fun being a band leader? It can be – with SongWriter. Once you've created your music, you can share it in more ways. Send the drummer an MP3 to hear the new song. Print the horn charts. Email the song to the keyboardist so she can open, play, print, and make minor edits with the free, downloadable Finale NotePad. This is just the beginning!